The Defenders of the Dead live in the past while they destroy the future. They face a revolt of the Young — a band of rebels led by two teenagers. Cerasi and Nield. 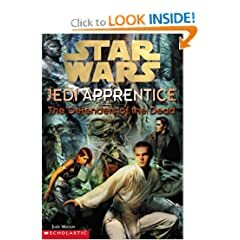 Thirteen-year-old Obi-Wan Kenobi and his Jedi Master Qui-Gon Jinn are not supposed to take sides in any war. But once Obi-Wan meets Cerasi and Nield, he feels he must join their fight . . . even though Qui-Gon forbids it.